Today In Hip Hop History: Who Murdered Hip Hop Legend Tupac Shakur? Are The OVO Air Jordan 8s Releasing? Dilla Day is one of hip-hop’s most celebrated holidays recognized annually on the birth date of the celebrated hip-hop producer, J-Dilla. Born on February 7, 1974, this year’s celebration marks what would have been Dilla’s 40th birthday. Headlined by De La Soul, the event highlight included an epic emcee battle with DJ Premier vs Pete Rock; both spinning up hits from the industries most loved artists from Jay-Z, Nas, Common, Gang Starr, KRS One, Rakim and more. A special video release from Phife Dawg from the Tribe Called Quest and set from Slum Village and De La Soul wrapped up the night. Commonly unknown to today’s hipster-hip-hop fans of the 90s, Dilla Day continues to highlight contributions one of the rawest and true versions of the hip hop/ instrumental art form. “It’s a shame that he didn’t receive his kudos while he was alive, but his legacy is strong. Dilla Day is an opportunity for new fans to get acquainted with his importance and for old fans to set a day aside to appreciate his contributions.” said William Ketchum, long-time J-Dilla fan and entertainment journalist. Many still ask if J Dilla is still relevant. With his untimely death on February 10, 2006 from complications from Lupus, hip hop has since developed a new sound, new look and new attitude. “It’s wonderful that Dilla Day is recognized via the net and among the hip hop community, but it HAS to be a holiday in Detroit. He’s the first person that comes to mind when the word producer even comes up in conversation. He came from DETROIT. Not the suburbs, not the nice part; that man came from the hood and took his music EVERYWHERE. He worked with TONS of people, and always kept Detroit with him in the process,” says Knox from the The Olympicks. “J Dilla is one of the most important figures in black music, and the impact he has made can still be heard today. Two of the last year’s most important musicians, Kanye West and Pharrell, revere J Dilla as hip-hop/music royalty. The soulful aura of his production and his immaculate drum work helped fuel the careers of much of the neo-soul and conscious rap movements: Tribe Called Quest, Erykah Badu, Busta Rhymes, Common, D’Angelo, Talib Kweli, and more, all owe gems to J Dilla. And since then, other producers have grown from his influence,” Ketchum adds. 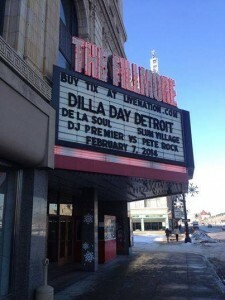 Stay in touch with the J Dilla Foundation and check out Dilla Day for yourself next February in Detroit. Copyright 2017. The NorthStar Group.